Plastic kits from Hong Kong. The very first kits came with a die-cast hull and vinyl tyres, later ones are completely out of plastic with "DS" (Dragon Styrene) tracks. If nothing is mentioned in the "Comments" box, then the kit is plastic with DS tracks. Apparently some kits were modified during their production run, replacing vinyl with DS tracks and possibly die-cast with plastic hulls. If you have more info, you are welcome to let us know. 7203 Tiger I Ausf. E Late Includes zimmerit molded into the plastic. Early kits with vinyl tracks, later ones with DS tracks. 7204 38cm Assault Mortar Sturmtiger Includes a cast metal hull. Otherwise a nice kit. Vinyl tracks. 7205 Sd.Kfz. 171 Panther Ausf. G Early Includes a very poor die-cast metal hull and chassis. Very poor fit. Vinyl tracks. 7206 Sd.Kfz. 171 Panther Ausf. G Late Same as Panther G early, but with the chin mantlet. No steel wheels. Vinyl tracks. Die-cast hull. 7226 M2A2 Bradley ODS Incorporates modifications resulting from Operation Desert Storm. 7229 M3A2 Bradley ODS Incorporates modifications resulting from Operation Desert Storm. 7230 PzBeobWg V Ausf. G Observer version of Panther. Metal hull. If you build the kit OOTB, you will get misaligned drive sprocket teeth. The left and right halves of the drive sprocket (on any given side of the tank) will not line up. First releases had the old vinyl tracks; later releases unsure. The kit has the part for the base of a Sternantenna (part 85) which is not for use. The Sternantenna is not included, but this part will help if the modeler wants to convert the vehicle to a command vehicle. Also note that the use of steel wheels on Brummbären was inconsistent, with some vehicles fitted with 16, 8, 4 or no steel wheels at all. Fairly good model. Plastic hull, but with vinyl tracks. 7247 M2A2 ODS Bradley OIF II Iraq 2004 Incorporates modifications from Operation Desert Storm. 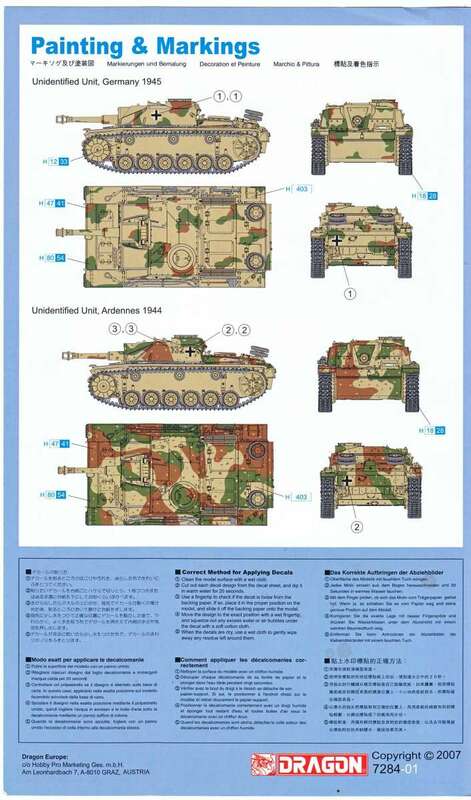 7249 Leopard 2A4 Armor Pro Series. Vinyl tracks (pre-painted). 7253 Sd.Kfz. 184 Elefant Highly detailed and accurate kit. Armor Pro Series. 7254 KingTiger Porsche Turret with Zimmerit If you build the kit OOTB, you will get misaligned drive sprocket teeth. The left and right halves of the drive sprocket (on any given side of the tank) will not line up. 7255 Maus Super Heavy Tank Very detailed and fairly accurate kit. 7256 E-100 Super Heavy Tank Very detailed and fairly accurate kit. 7260 Stug IV Late Model Highly detailed kit, with DS100 tracks. 7262 T-34/76 Mod. 1941 Cast Turret Same model as the earlier kit but with a cast turret. 7266 T-34/76 Mod. 1942 Highly detailed kit with a correctly shaped hexagonal turret and DS 100 tracks with enough slack to produce a nice sag. Earlier releases have PE set for engine that doesn't fit the plastic part, later releases have this fixed. Vehicle 1023 has the wrong type of turret (the kit is hard edge, the real vehicle soft edge) and lacks Swastikas. The most important feature of this kit is the bedspring armor. The kit instructions provide decals for one vehicle with the bedspring, "K 220," claiming it is of an "unidentified unit, Eastern Front 1944". 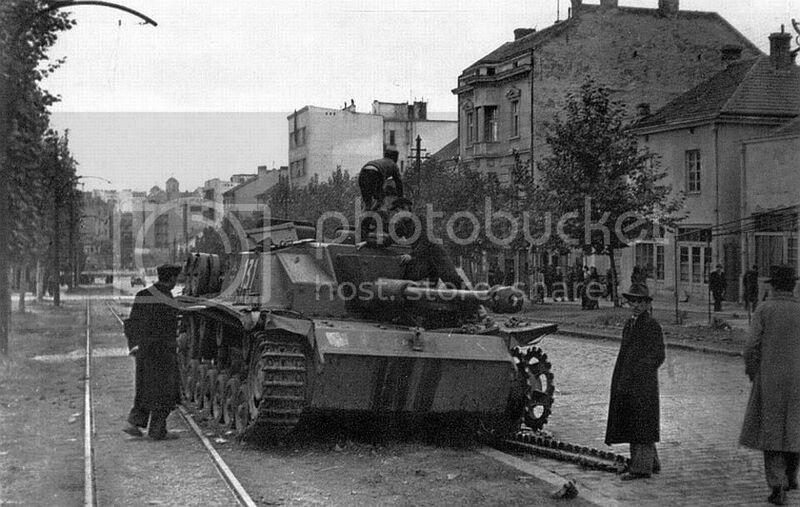 The marking of "K 2XX" with a white band is a feature of 36th Tank Regiment, 11th Tank Corps, seen in Berlin. In addition, there are no known pictures of "K 220." All vehicles of that regiment seen with the bedspring armor are in the "K 23X" range, and, even then, not all vehicles in the "K 23X" range have bedspring armor. You may think you can get away with the problem by buying Colibri Decals set 72018, which does include decals for "K 230," "K 235." and "K 239." Well, not so fast. The base kit represents a vehicle made from Factory 183. 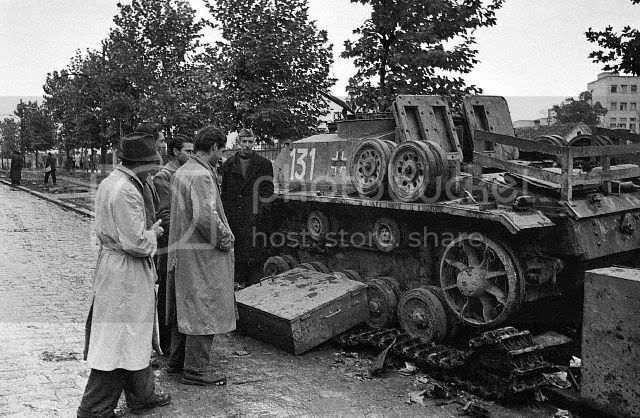 However, the vehicles of 36th Tank Regiment were made in Factory 112. There is, as far as I know, no 1/72 kit of a Factory 112 machine. To convert the Dragon kit into a Factory 112 representation requires, at the least, modification of the rear. (See here and here.) The turret also requires extensive modifications. Wheels would also have to be swapped. 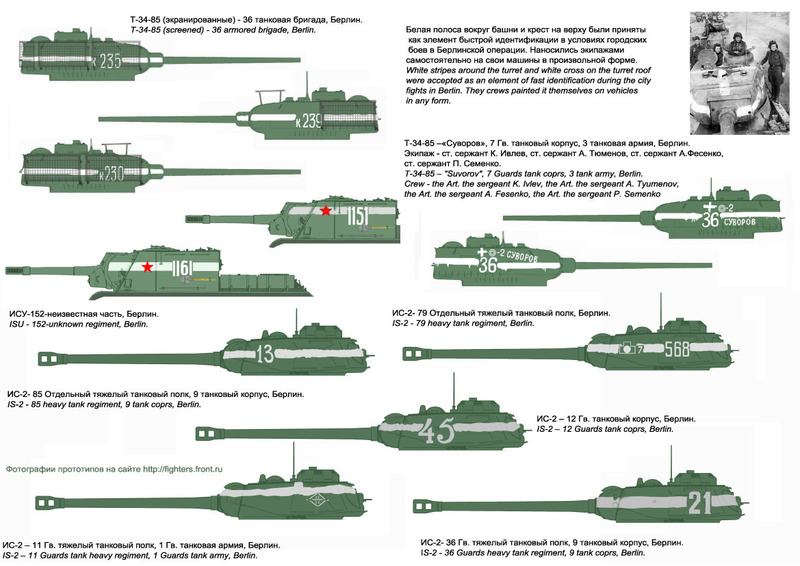 There are other Factory 183 vehicles with bedspring armor. However, there are no known decals for these vehicles. Also, it may be necessary to represent them with Revell instead. A proper representation of a vehicle with the bedspring armor may neither be trivial nor cheap. 7271 M4A3 (76) W VVSS Sherman Highly detailed plastic kit. Vinyl tracks in very first kits, DS in later kits. 7273 M4A1 Sherman Normandy Cast hull version (the original tank, not a die-cast model part). Vinyl tracks in very first kits, DS in later kits. The earliest releases had a problem with the bogies, but has been revised to include the corrected bogie sprue. Also, the turret sprue has been replaced with the turret from the M4A2 Sherman III kit. 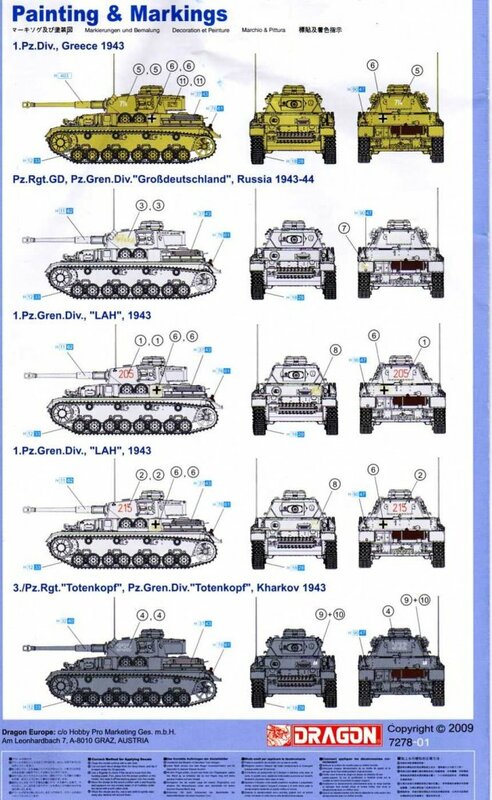 According to Timothy Lau the "Totenkopf" marking option is actually a vehicle from "Wiking", seen here or here and would need parts of an Ausf.F2 kit like the globular muzzle brake. Lifting hooks on air exhausts upside down; fender braces too short; driver visor in closed position. Timothy Lau points out that the decals for "132" might possibly be based on this vehicle (here and here). 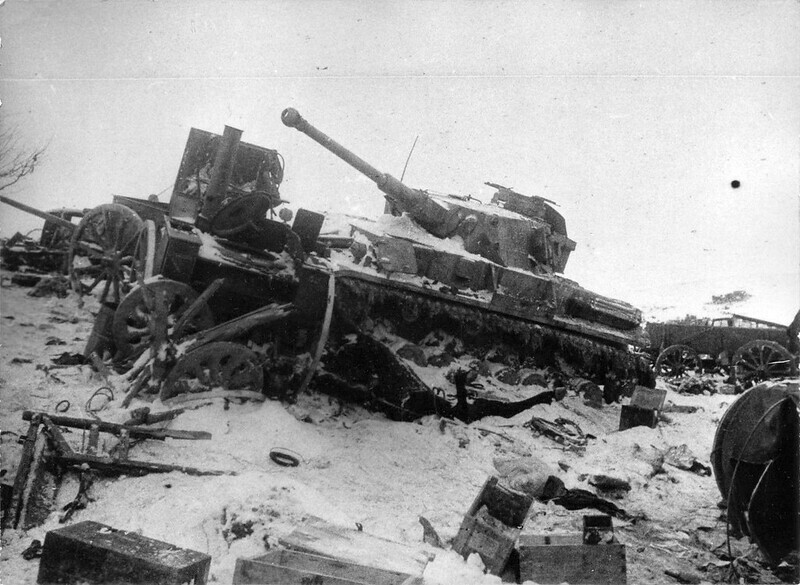 If so, it was not a StuH and it was not in the Ardennes and it was not an ambush scheme. 7293 Jagdpanzer IV L/70 Late Production Beautifully detailed with several extra bits in the kit (such as metal gun barrel and photoetch), but with some incorrect angles on the hull. 7303 Firefly Vc 17pdr armed version of the M4A4 hull. Vinyl tracks. 7306 Sd.Kfz 251/2 Ausf. C mit Wurfrahmen 40 Actually a /1. Highly detailed Kit. 7312 Sherman Mk. V "Tulip"
7339 Panther G with steel road wheels Apparently dimensionally accurate, but still based on previous Panther kits, which means poor instructions and poor casting quality. DS tracks, no PE. 5 marking options. 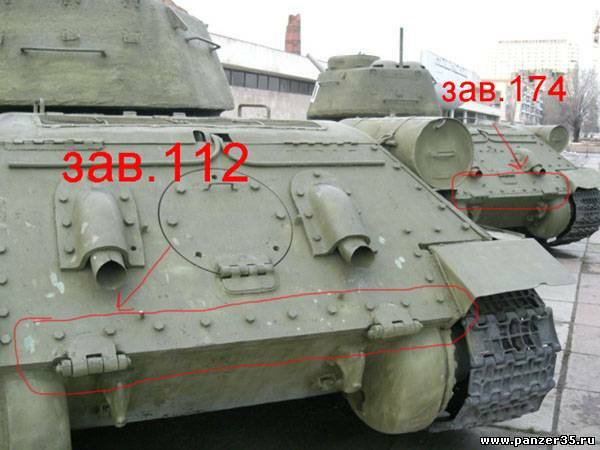 According to Timothy Lau the marking option for 11 Pz.Div. is questionable. The parallelogram in the instructions is perhaps not applicable to this vehicle. 7361 Fallschirmjäger and Panzer VI KingTiger - Part 1 If you build the kit OOTB, you will get misaligned drive sprocket teeth. The left and right halves of the drive sprocket (on any given side of the tank) will not line up. 7364 LAH Panzergrenadiers + Sd.Kfz.251/7 Ausf.D, Ardennes 1944 Set of four figures with some spare parts, like a Sd.Kfz.251/7 Ausf.D. This set reflects the original scenes photographed on 18 December 1944 in Poteau (Ardennes, Belgium). The four figures are completely new toolings. The grenadiers are depicted enjoying a cigarette in a lull after their successful ambush. 7370 Pz.Kpfw. VI Tiger I Ausf. E (Sd Kfz 181) "Initial Production" With a bin of each side of the turret. 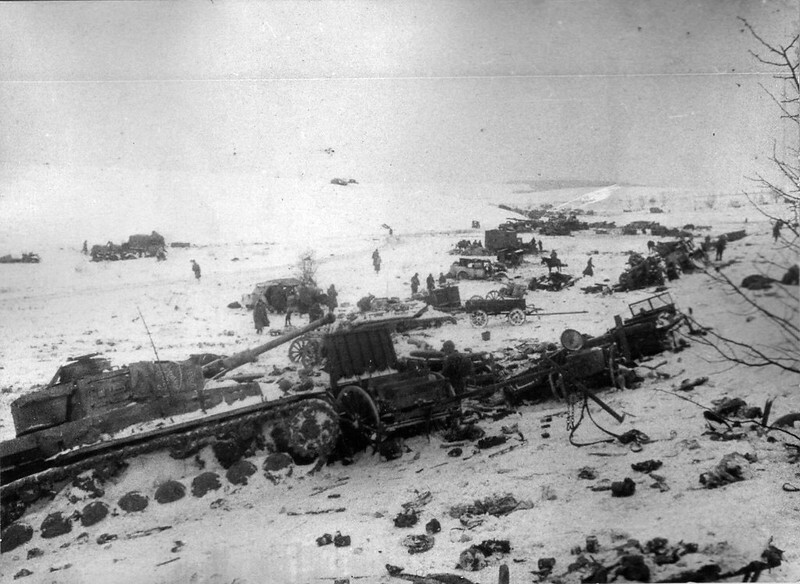 One marking option for a vehicle on the Leningrad front in 1942. 7374 7.5cm PaK 40 w/Gun Crew + 3.7cm PaK 35/36 Includes PE, decals, and five multi-part figures. The equipment for these figures is plentyful, with 22 weapons (Kar98k, G41/43, MG34, MG42, MP38/40, MP44, MP3008) provided and a lot of personal equipment. The kit has two decal options.The decal option for vehicle "123" in this and the 1/35 kit was based on an erroneous interpretation (here and here). 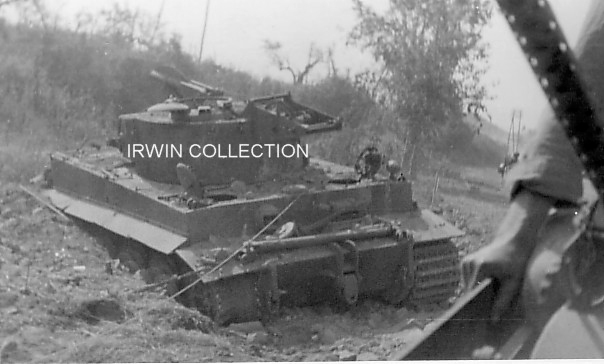 This is the Tiger with a Panzer III bin on the rear of the turret. These kits are not simple declinations of earlier Tiger kits, but highly improved molds, with correct asymmetric turrets, open hatches with detail on the underside, full radiator detail, a rudimentary turret interior and better detail. DS tracks, no PE. Turret hatches can be opened. Bogies require little work thanks to slide mold technology. Three marking options: Tunis and two Dieppe, although for the latter the specific equipment for the exhausts is not provided. Contains all parts to build the kit as an Sd.Kfz.231. Confusing instructions (e.g. wheels are "optional", horn installed backwards). Four marking options, shown without spaced nose armor, engine grille cover or spare tyre, which are shown in the instructions and boxtop. Timothy Lau points out the following: The cable mounted on the spaced nose armor is a very rare item and, because the kit represents a Serie 3 vehicles, the armored cover over the grille (C16) is not optional as the instructions suggest. If I am not mistaken, the flag staff (B18) should also NOT be installed as directed by the instructions. 7439 LRDG Chevrolet with Lewis MG The model features decals for "Te Aroha," which, in real life, is "Te Aroha III." (There was a "Te Aroha" but the decals weren't meant to represent that one.) The builder should consult the numerous threads about the Tamiya 1/35 kit which prsents the same flaw or this link. Same problem with instructions as 7429. Five marking options. Timothy Lau adds: The hull only has the old style vision port. So the kit represents a Serie 1. A tweak list can be found on Armorama but is incomplete. "B7 and 8 are covers for the reversible lamp reflectors and their location is marked on the hull side with a small ridge; this is best removed as it positions the covers too near to the split crew access hatch. The hinges of them should sit right on the angled edge either side of the apex of the sloping lower hull plate - refer to a photo or even the box art, but not the painting guide. Being separate parts has the effect of making them stand out noticeably more from the body than the access hatches, while photos show that both should be similarly only very slightly proud of the plate they are set in to. 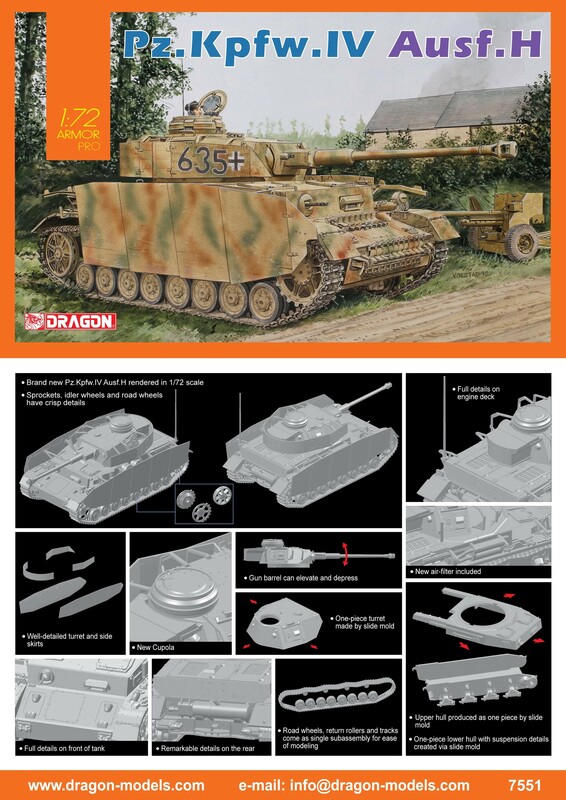 This raises the issue of which version of the 263 the kit represents; according to Hilary Doyle and Thomas Jentz in Panzer Tracts no.13-2, this cover was deleted from May 1941, so if modelling a later vehicle you could leave the covers off completely, and just remove the locating marks. This is not shown as an option in the instructions, but may perhaps be the reason for these parts being separate." Armorama is absolutely correct that the covers must be shifted. However, the comment that the cover can be deleted is not right because the deletion is not part of Serie 1. Interestingly enough, because Dragon represented Serie 3 of SdKfz 232 and 231, Dragon's SdKfz 232 and 231 are not direct competitors of Roden's. But because Dragon represented Serie 1 of SdKfz 263, Dragon's SdKfz 263 is a direct competitor of Roden's. This kit contains all the parts of kit 7446, except part D14, but includes additional parts for the frame antenna. The kit seems to represent a 5.Serie vehicle, based on the placement of the turn signals and the width indicators and the shape of the antenna. The first decal option is for this vehicle. WH 522808 is a 4.Serie, not a 5. Serie. The second decal option is for this 2. Pz.Div. vehicle. It is a 4th serie vehicle. Kit 7447 includes the parts of 7420 (Sd.Kfz. 223). According to the review of that kit, the 7420 antenna is the 4. serie antenna. So maybe it is possible to build 7447 as a 4th serie vehicle. Still, I am not entirely sure what needs to be fixed with the hull to make it a proper 4th serie vehicle. Maybe the 2. Pz.Div. decals are useful on the ICM 72441, which is a true 4th serie kit. Because the kit represents the 5th serie, yellow paint should be used, not grey. I noticed that many 4th serie 261s had some box in the front: Neither ICM nor Dragon have the part. 7481 SAS Raider 4x4 Truck In the Common Tongue: a Jeep as used by the SAS in NW Europe. The same comments apply as for kit 7423. The wheel hub pattern is a rare (?) type. No decals are included and only one marking option is suggested. The instructions are very doubtful. I suspect the builder needs to adapt the instructions from 1/35 kit 6820. There appears to be a need to use parts that aren't supposed to be used and to ignore instructions about which parts to use. For example, for the "131," you need to use the earlier two canister Feifel, which is not what the instructions tell you to install. Also, the builder should go read David Byrden's site on kit 6820 for help about the other marking instructions. David Byrden also noted to me that the hull top is of a Mid Tiger. The C-hook has to be sliced off. Same problem with instructions as 7429. Five marking options. No PE. Timothy Lau adds: There is a problem because the base kit represents a Serie 3 vehicle with the new vision ports on the hull and on the turret. According to kfzderwehrmacht.de "21 Sd. Kfz. 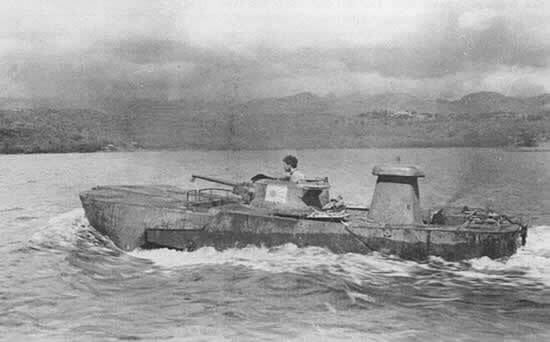 231 of the third series were made from February to Mai 1941 [sic]. 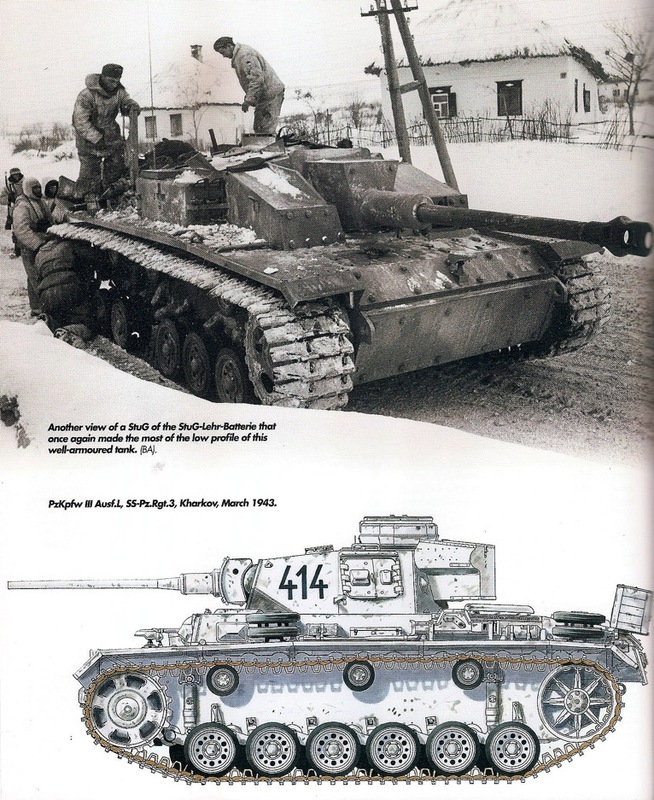 Because the new armoured superstructure of the third series was delivered by Boehler beginning in May 1941, these vehicles had most probably the armoured superstructure of the second series. For the third series, the turret was completely changed. The front was broadened and heightened. The gun mantled was modified and offered more protection. Now all vision ports were Einheitssehklappen. Officially, no Sd. Kfz. 231 were produced after May 1941. Therefore, the shown vehicle of 13. Panzer Division was most probably a converted Sd. Kfz. 232. The photo was made in Ponomarew in early summer 1942 just before the beginning of the new offensive." So if you want to use this kit (or kit 7429) to represent the SdKfz 231, you can only represent vehicles that theoretically were produced in May 1941. I cannot for my life find any picture of an SdKfz 231 with the new vision ports on the hull and on the turret, except for that converted 13. Pz.Div. vehicle mentioned above. Until more historical documentation is found, the SdKfz 231 kit should be avoided in favor of the SdKfz 232. Any person trying to model the SdKfz 231 in particular could consider Roden's kit. 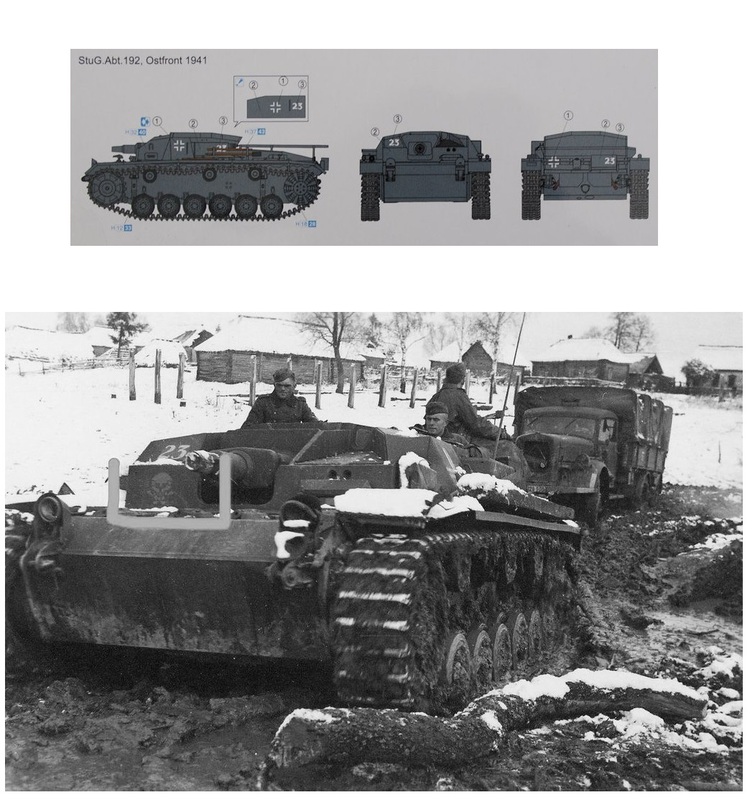 On that note, because the Dragon SdKfz 231 and 232 kits represent Serie 3 vehicles, the armored cover over the grille (C16) is NOT optional as the instructions suggest. If I am not mistaken, the flag staff (B18) should also NOT be installed as directed by the instructions. The instructions are copies of the kit without floats (7435). If you follow them, you will be installing parts to the nose that will impede the fitting of the pontoons. You will also need to shave off some fittings from the engine deck to make the tower fit. Overall fit is sub-optimal. According to Timothy Lau, the tower (parts A3, A4, A13, A14) was very rarely fitted to the real vehicle. 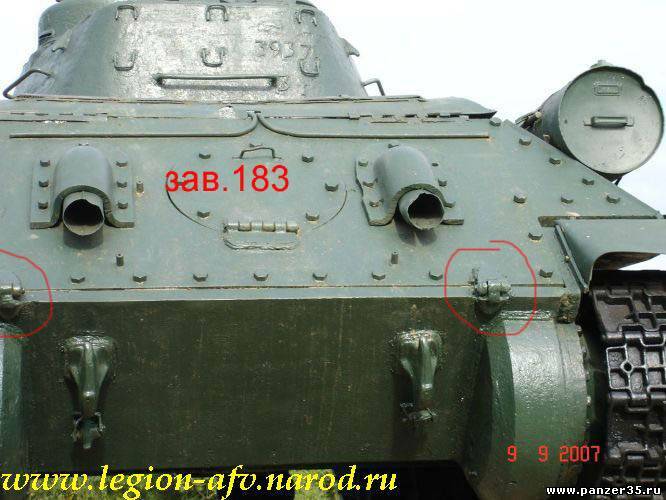 7493 VK.45.02(P)H Comes with two gun barrels and breech block, bot no other interior parts. No PE. If you expect a kit similar to Dragon’s excellent PzIV Ausf. F/G kits then do not buy it. Compared with these kits a lot of details were simplified and the number of parts is reduced. There is also some flash on the sprues which is very unusual for Dragon. The skirts (Schürzen) are molded with the holding rail at the bottom instead of the top. To correct this mistake you have to sand down the skirts and scratchbuild a new rail. The DS tracks were not only warped but also twisted because of inattentive packing. The missing Filzbalg Luftfilter, antenna rail and the cover for the close defense weapon date this vehicle in my opinion to (approximately) February 1944 , which is the middle of the Zimmerit period. - No spare tracks at all (upper/lower hull, right sidewall, back wall and fenders) even though the box art shows a lot of them. - No skirt holders on the skirts and no hooks on the fenders as on the Stug IV/Brummbär kit. In relation to the higher kit price (in Europe double the price of a Revell Pz IV) I would recommend to buy the Revell Pz4H kit instead and add some smaller details there. With the saved budget you at least have some money for one PE- or Zimmerit set. It was first thought that perhaps later releases of this kit have corrected Schürzen rails, as a ready made Dragon Model (60656) can be seen with them. It seems that this is not the case. However, it is apparently selling the coorect Schürzen parts as part of kit 7551. The ready-made 60656 is therefore based on a never-released version that represents the best of the combined 7497 and 7551. This kit has all the parts that 7439 has. The model features decals for "Te Aroha," which, in real life, is "Te Aroha III." (There was a "Te Aroha" but the decals weren't meant to represent that one.) The builder should consult the numerous threads about the Tamiya 1/35 kit which prsents the same flaw or this link. 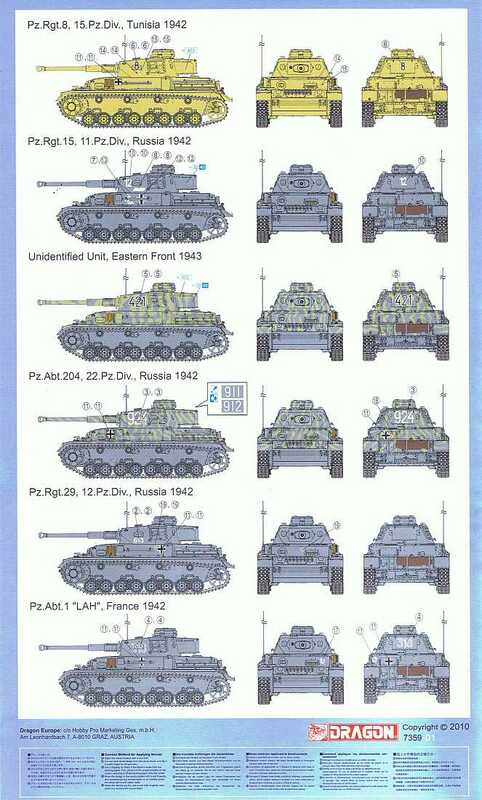 The late Panther Ausf D kit is the same as the 7494 early Panther kit. The only differences are the decals provided with the kit and the assembly instructions. All the parts supplied in the box are the same, the instructions mark what to cut off to get the late D Panther. This is not entirely correct : the wheel sprues are different. Early Panther D comes with a sprue of 16 bolts wheels, while late D comes with the 24 bolt ones for the outer wheels, the inner roadwheels (facing toward the hull) are still 16 bolts. 7507 Churchill Mk.IV NA 75 Includes British built 75mm barrel plus 6pd barrel and normal (US) 75mm M3 barrel. Hatches can be opened and cupola rotated. Three finishing options. Consists of 2x kit no. 7490 plus new tooling for ferry. 7530 Pz.Kpfw.IV Ausf.D The kit instructions suggest throwing away parts 54,55 and 56. The builder should carefully evaluate the historical references before actually doing this. For instance, the 8. Pz.Div. vehicle in the decals llooks like it needs parts 54 and 55. Part 56 is the spare tracks and it seems silly to not install it on the starboard side. 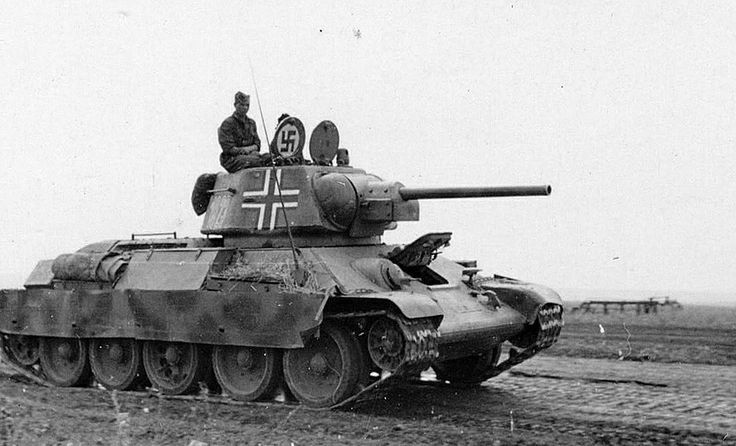 Kit 7551 represents an earlier version of the Ausf. H than kit 7497, which puts it in direct competition against the Revell kit. Kit 7551 has the corrected rails and the air filter that kit 7497 lacks, but it does have the awful rubber wheels + tracks combo and lacks various details. 7604 Sd.Kfz.251 Ausf.D mit Wurfrahmen 40 (2 in 1) "2 in 1" means with 28cm or 32cm Wurfkörper. 7605 Sd.Kfz.251/7 Ausf.D Pionierpanzerwagen (2 in 1) "2 in 1" means with or without 28cm sPzB 41, at least that's what the box says. 28mm would be more than enough for the sPzB 41, but it does get its own carriage if you leave it off.